I want to pass my enthusiastic congratulations to the Hintonburg Community Association on the near-completion of its 40 km/h initiative. Its press release is copied below. In summary, its volunteers have achieved the required 66% concurrence from residents on every street to reduce the speed limit to 40 km/h. All that remains, we're told, is to put up the signs. This is an opportune time to note that the HCA shouldn't have had to do this. They've made a back-of-the-envelope guess that going door-to-door and adhering to the administrative process for accomplishing this was likely around 1,700 hours of work. There's no reason to doubt that this is in the right ballpark. I'm very thankful they were willing to put so much time into this, but that's a huge opportunity cost to other potential initiatives. The process as it exists today is unacceptable, partly complicated by Provincial legislation. The default speed limit in unsigned areas under the Highway Traffic Act is 50 km/h, and deviations from that are required to be signed. A wholesale reduction in the limit would thus be a huge cost to the City that it understandably isn't willing to bear. Changes to those rules, though, are on the way from Queen's Park to make setting default speed limits easier, and the City continues to explore residential speed reductions. My strong expectation is that within some reasonable time period, we won't have to ask volunteers to undertake such an arduous process. There's a first CTV story available now here. Here's the HCA's release copied below. 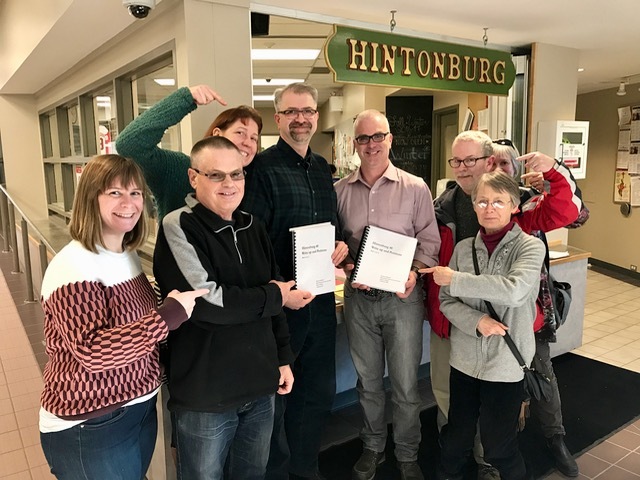 HINTONBURG – Following a 13 month long door-to-door signature drive, the Hintonburg Community Association (HCA) is proud to announce they have collected the necessary support to change the neighbourhood-wide speed limits from 50 km/hr to 40km/hr. The 1286 residences supporting the speed limit change surpasses the required minimum threshold of 66% of support on each of all 31 residential Hintonburg Streets to make a change in the speed limit. This fulfills the City of Ottawa’s stated requirements to initiate a speed limit change; a process currently underway that will culminate in new 40km/hr speed limit signs installed followed by effective monitoring and enforcement of these new limits. The completed petition package was dropped off to City Hall on March 9th. It has since been verified and passed along to Kitchissippi Councilor Jeff Leiper for his concurrence, which has been granted. With a few hurdles left, the HCA is hopeful that a timeline for sign installations will become available shortly. Any updates and details, along with potential photo opportunities, will be announced on the HCA's official twitter account, @HintonburgCA.